OMG Posters! » Archive Gulf Charity Print by The Heads Of State - OMG Posters! This has been around for a few days, but it really deserves to be seen by more people. The Heads Of State’s Gulf Charity Print is an 18″ x 24″ screenprint, has a first edition of 200, and is $40. Half of each sale will be donated to Oceana to help with their gulf cleanup efforts. Visit The Heads Of State. I don’t get it. An American corporation is responsible for the oil leak, but what’s with the upturned corner? and why would a person hang thing on their wall? Seems like a bit of a downer. 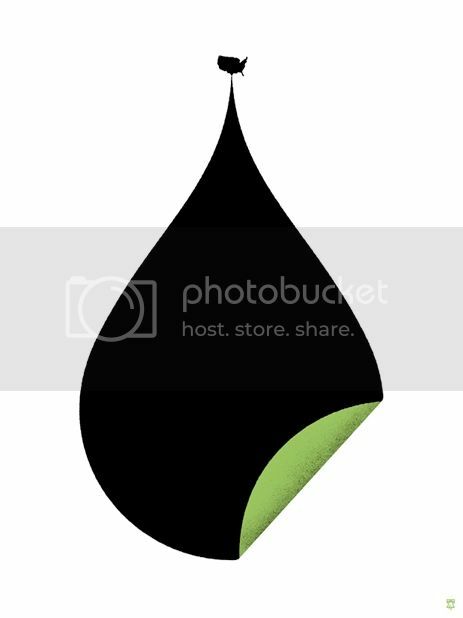 The upturned green corner represents BP – behind the oil spill? It’s a nice graphic, but I agree, it would be depressing to have a constant reminder on your wall….